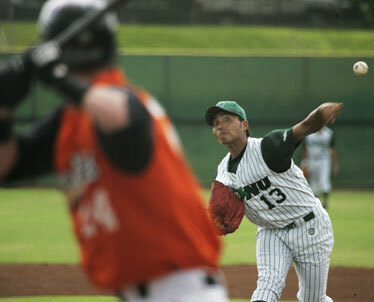 Shinya Nakayama of the Honu pitched to Anthony Hatch of the Canefires yesterday. A solid finish to the regular season in Florida carried over into a strong start to the Hawaii Winter Baseball season for Chris Errecart. The Milwaukee Brewers prospect went 3-for-5 and hit a go-ahead three-run homer in the fourth inning to lead the North Shore Honu to an 8-5 win over the West Oahu Cane Fires in the HWB season opener yesterday at Hans L'Orange Park in Waipahu. Errecart's opposite-field blast in the fourth inning cleared the 387-foot sign in right-center and banged off the scoreboard as the Honu rallied from a 5-0 deficit to claim the victory. "I don't care where you're at, what level you're playing in, if it's a spring training game or a fall game," North Shore manager Kevin Bradshaw said, "any time you can show you can come back, the confidence helps in games to come." Errecart's homer was the big blow in an 11-hit attack for the Honu and the bullpen protected the lead by surrendering just one hit and two walks over the final seven innings. Honu relievers Blair Johnson, Takashi Kamoshida and Charles Benoit combined to retire 16 of 17 West Oahu hitters from the third through eighth innings. After starter Shinya Nakayama was knocked around in West Oahu's five-run second inning, Johnson settled things down and picked up the win. Benoit was credited with a two-inning save. "You get to kind of cheat and see what they've been doing," Johnson, normally a starter in the Pittsburgh Pirates organization, said of entering the game in a relief role. "It was more a matter of adjusting to the mound, and once that started happening I started locating my two-seamer down and getting ground balls." Johnson threw just 31 2/3 innings with Lynchburg this season, missing about two months with a torn labrum, and was assigned to the league to continue his comeback. "You don't learn when you're not on the mound, so this is just a huge learning experience," Johnson said. "Every day you go out and you get a feel for each pitch and hopefully you can take this experience into next year." While many of the HWB players had some down time following the end of their minor league seasons, Errecart didn't have much of a break. After playing in the Florida State League playoffs with the Brevard County Manatees, the first baseman went back to the Brewers' training facility in Arizona for more practice. The extra work appeared to pay off yesterday when he lined two sharp singles and gave the Honu the lead with his homer. "I ended the season pretty well there, so I think it really helped me coming in here," Errecart said. "My level of confidence is pretty high right now. "I think I was more surprised than anyone else," he said of the homer. "I just tried to get the ball in the air and get the runner in from third base and it happened to go over." West Oahu sent 10 batters to the plate in taking the lead with a five-run second inning. Ninth-place hitter Ryan Rogowski accounted for the first runs of the HWB season with a two-run double to left. Joshua Bell drove in two more with a double of his own. North Shore rallied with two runs in the third inning, then struck for four in the fourth. Cale Iorg, son of former major leaguer Garth Iorg, went 2-for-5 with an RBI and a stolen base. "The biggest thing was how we ran the bases," Bradshaw said. "We got some guys over to third base with less than two outs and we were able to get them in and get back in the game and then the big home run put us up." HWB's opening weekend continues today with the Honu and CaneFires meeting again at noon. The Honolulu Sharks face the Waikiki Beach Boys at 6:30 p.m. Seven Waikiki pitchers combined to blank Honolulu on four hits and four walks. Brant Rustich earned the win with an inning of relief. Dan Murphy and Hector Pellot each had two hits and two RBIs to pace the Waikiki offense.